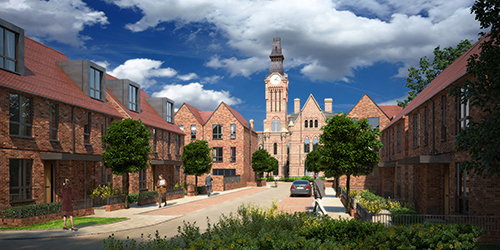 Barnes Village is a Grade II listed historic site near Stockport, comprising 38 apartments and townhouses – constructed within and attached to a restored French Gothic Revival hospital building – and 117 newbuild, two to four bedroom properties in the 16.5-acre grounds. Barnes Hospital was founded in 1875 and served as a convalescent hospital for the Manchester Royal Infirmary until 1999. It began to fall into dereliction thereafter, despite listed status. Henley’s careful conversion and restoration will bring a new chapter to the old building. Spacious, modern homes, with sharply-pitched roofs and large windows, echo the drama of the old, but with the elegance and convenience of the new. Together, they create a new village with accessible transport connections and pre-existing links to surrounding communities. Prices are from £145,000 (one bedroom conversion apartment) to £425,000 (new four bedroom house); an average of £252 per sqft. Homes are eligible for Help to Buy and completions start in spring 2017.